So the past few weeks, I'm proud to say that I've been pretty consistent about my "post-Holidays, pre-NY Fashion Week" diet plan. My meals have consisted mostly of low calories soups (thanks Progresso!) and nutrient-rich salads, I've been hitting the gym aggressively almost everyday, and I've been abstaining from alcohol (which has required more willpower than imagined). I feel healthier and stronger (and somewhat richer with all the $$ saved from dining/drinking out)! However, any good dieter knows that moderate "splurge" items are necessary to keep oneself on track. So what's my "splurge" item you ask? Answer: Chocri Customizable Chocolate Bars! Last month, chocri, a German chocolate house that just launched its US operation, gave me an opportunity to test drive their customizable chocolate bars. Basically, when you go to their website, you first choose a base chocolate bar (milk, dark, and white) and then add your favorite toppings from a selection of over a 100 different items (including dried fruit, nuts, and super exotic items stuff like edible gold flakes and candied flower petals). Your customized bar is then handmade in Germany and shipped to your door in a few days (You can even pick a name your bar!). All bars are made with only high quality fair trade/organic chocolates from Belgium - quality and creativity all rolled into one! All three bars I made were awesome, but my favorite one by far (which I aptly named "A Sweet Idea") consisted of a white chocolate base topped with macadamia nuts, dried blueberries, dried cherries, dried pineapples, and finished with marzipan carrots. Not only was this bar super satisfying to my sweet tooth, it also was (somewhat) healthy with the nuts (protein), dried fruit, and marzipan carrots (ermmm...veggies). Each bar runs about $13-15 (depending on the number of toppings) - which is NOT BAD AT ALL for a customized, innovative, and delicious piece of chocolate. 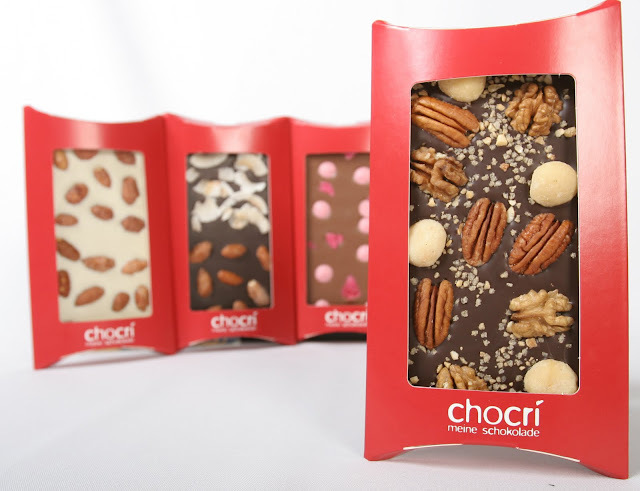 So as a gift - for a friend or yourself - the chocri bar gets two thumbs (and two toes) up! 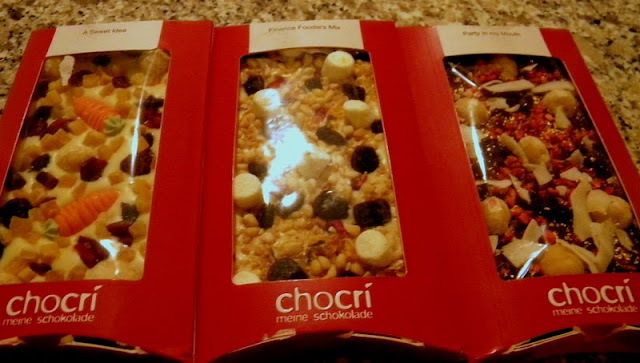 Chocri has generously agreed to give one lucky financefoodie.com reader 3 customizable bars of their own! Contest ends January 26, 2010 at 5pm EST. Winners will be chosen via random integer generator on random.org announced on the financefoodie.com site shortly afterwards that night! My favorite topping on Chocri has to be the ground chili. Love my chocolate with some bite! I've been following this site and am so excited to it's US version to up and running! I can't decide between Orange Chocolate Drops and Organic Mint Leaves. There are so many marvelous choices, it's really hard to choose. The Cappuccino Chocolate Drops would be my favorite topping. Milk chocolate with walnuts and toffee. Or with the strawberry yummies. Oooh white chocolate with apricots and honey chocolate dots. Let's go with honey chocolate drops. Following chocridotcom on twitter as ky2here1. My favorite topping is the Caramel Chocolate Drops! Mmmmm!!! My favorite topping would have to be goji berries! I think my favorite would be the Caramel Chocolate Drops. My favorite topping would be gummy bears! My chocolate bar would contain: dark chocolate, straweberries, pecans , and mini marshmellows. I follow u and chocri on twitter! My favorite would be cranberrys. But honestly i would like to try Real Gold Flakes would be interesting and a new experience. Caramel Chocolate Drops is my favorite topping! I enjoy cashews with my chocolate. Mmm the mint sounds great and you could make a Valentine creation! I like how you can enter a code to re-order your creation, whew less work for more! Pear would be interesting to try, thanks. My favorite topping is coconut (I wish they would also offer toasted coconut). If have to pick just one, it would be macadamia nuts. And I like your thinking--marzipan carrots as vegetable! My favorite topping would be orange chocolate drops. Please enter me. caramel chocolate drops would be my topping. coconut and sour cherries YUM! the gummy bears sound great. My favorite topping is the Caramel Chocolate Drops. Honey Chocolate drops sound tasty. Thanks for the chance. My favorite topping is the Strawberries. yum...i like sour cherries and hazelnut brittle. craving chocri now! Ground chili! Chili and chocolate seems like an odd combo but it's actually really good. I'm going for one that you already mentioned... the marzipan carrots! I adore marzipan! It was followed very closely by the marzipan rose and then the lemon chocolate drops! I like the strawberry topping! I Like the Orange Chocolate Drops and pecans. cappucino chocolate drops are my favorite! Girl I am ALL about the macadamia nuts! I've got two giveaways up that you should enter on PSS! It entirely this is the best idea EVER! I want a dark chocolate bar with dried cherries, sea salt, toasted hazelnuts, and toffee. My favorite topping would be the Brazil Nuts. My favorite topping is Pecans :) *Thanks* for the giveaway! Too many choices, but, love walnut. Your soy bacon sounds interesting. I liked the smiley heart shape (female). Hard to choose just one favorite but I will go with Macadamia Nuts. They have some many different amazing toppings! I'd love to try Candied Lilac. My favorite topping would be raisins! I love peanuts! I love all nuts really in my chocolate though. I like my lemon chocolate drops. Marzipan carrots all the way!!! I call my boyfriend hare and he calls me bunny. What could be more perfect? I've never seen anything so cute before! Mmm..my favorite topping is the pecans..I just love 'em. I like the Orange Chocolate Drops. My favorite topping is the Caramel Chocolate Drops. I'm surprised they don't offer Peanut Butter Drops though. Those would be my favorite. I follow Chocri on twitter as MelodicMom. My favorite topping would be cashews. I love cashews, especially in chocolate. YUM! I think my favorite topping would be Hazelnut Brittle. I think I would like ginger and walnuts. Thanks. I would like dark chocolate with cashews, macadamia nuts, and, yes , I'd love to try some of those edible gold flakes! My goodness this looks delicious! I like the Caramel Chocolate Drops. Thanks for the great contest! Coconut is my fav topping! My favorite topping would be Cashews! Dark chocolate with cappucino chocolate drops. My favorite topping would be crystallized violets, how decadent! Can I only have one favorite topping? Because I like pecans and sour cherries equally. My favorite topping are the blueberries. The Honey Chocolate Drops sound good. Thank you! I know my son would love the gummy bears the best. My favorite topping on Chocri has got to be Cornflakes! My favorite topping has to be the mango cubes. Yummy! I know it's silly but my favorite topping would be the Cinnamon--Lindt usually makes a chocolate cinnamon bar at Christmas that I couldn't find this year. Chocolate & cinnamon are Goooood together!!! These looks fabulous. I would choose the milk chocolate and my first choice of a topping would be Strawberry, my favorite. I would love to try the Ultimate Nut Chocri! My favorite topping is sea salt! My favorite topping would be walnuts and pecans. ooh, the Ginger would be great! i follow chocri on twitter - js22222222 . Okay, I'm putting Candied Lilac down, but the BACON topping intrigues me. My favorite topping is Macadamia Nuts. These sound so yum. My favorite topping is the Toasted hazlenuts but there are many others that caught my eye. I really want to try the gummy bears! My favorite topping would have to be pecans. They (and almonds) are my favorite snack food. I follow Chocri on Twitter as willitara. Not copying the person above me, but I LOVE the idea of hazelnut brittle. I would skip the fruits though. My favorite topping would be the coconut shavings or ginger, yumm! I like the strawberry chocolate drops on white chocolate. I follow chocri as wiscmom24 on twitter.